What are symptoms of Churg-Strauss syndrome? How is Churg-Strauss syndrome diagnosed? How is Churg-Strauss syndrome treated? What is the outlook (prognosis) for patients with Churg-Strauss syndrome? Churg-Strauss syndrome is a disease characterized by inflammation of the blood vessels. Churg-Strauss syndrome occurs in patients with a history of asthma or allergy. Symptoms of Churg-Strauss syndrome include fatigue, weight loss, nasal passage inflammation, numbness, and weakness. The ultimate test for the diagnosis is a biopsy of involved tissue. Churg-Strauss syndrome is one of many forms of vasculitis. Vasculitis diseases are characterized by inflammation of blood vessels. Churg-Strauss syndrome, in particular, occurs in patients with a history of asthma or allergy and features inflammation of blood vessels (also referred to as angiitis) in the lungs, skin, nerves, and abdomen. The blood vessels involved in Churg-Strauss syndrome are small arteries and veins. Churg-Strauss syndrome is rare. The cause of the syndrome is not known, but it involves an abnormal over-activation of the immune system in a person with underlying bronchospastic lung disease (asthma). While Churg-Strauss syndrome has been reported to be associated with certain asthma medications, called leukotriene modifiers, whether they actually cause the disease or whether the patients that take them have more severe asthma that lends a tendency toward the development of Churg-Strauss is not yet clear. Churg-Strauss syndrome causes fever, weight loss, and sinus or nasal passage inflammation in the patient with asthma. Fatigue is common. Sometimes the asthma actually improves somewhat as the disease intensifies elsewhere. Cough, shortness of breath, and chest pain can occur as the lungs are affected by vasculitis. Skin lumps, called nodules, can appear on the extremities. Diarrhea and pain in the belly occur due to blood vessel inflammation within the abdomen. The bladder and prostate gland can become inflamed. Numbness or weakness of the extremities is the result of nerve injury from the vasculitis. If the brain is affected, seizures or confusion can occur. 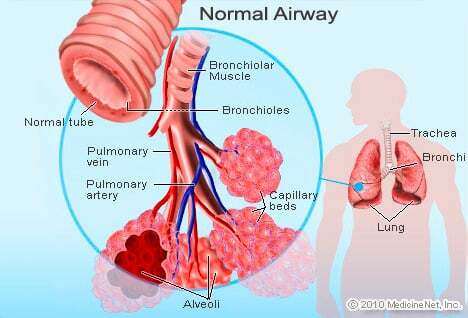 Churg-Strauss syndrome is suggested when the symptoms described above occur in a patient with a history of asthma. Abnormalities of the lungs, skin, and nerves might be noted by the doctor during the examination. Blood pressure can be elevated. Blood examination generally shows elevated levels of an uncommon white blood cell, called an eosinophil, and other white blood cells are also elevated in number. Kidney function blood tests and urinalysis can be abnormal when the kidneys are affected (which is not common). If the lungs are inflamed, the chest x-ray image or CT scan of the chest can demonstrate areas of inflammation. The ultimate test for the diagnosis is a biopsy of involved tissue, which demonstrates a characteristic pattern of inflammation visible under a microscope. Eosinophil are also seen accumulated in the abnormal tissue. The treatment of patients with Churg-Strauss syndrome is directed toward both immediately quieting the inflammation of the blood vessels (vasculitis) and suppressing the immune system. Treatment usually includes high doses of cortisone-related medication (such as prednisone or prednisolone) to calm the inflammation and suppression of the active immune system with cyclophosphamide (Cytoxan). Traditionally, cyclophosphamide has been given for a year or more in patients with Churg-Strauss syndrome. In a research study, Churg-Strauss syndrome patients did equally well if treated with cyclophosphamide for 6 or for 12 months. This study suggests that doctors might now be able to recommend a shorter (and, therefore, less toxic) course of Cytoxan for patients with Churg-Strauss syndrome. Churg-Strauss syndrome is a serious disease that can be fatal. Untreated it is extremely dangerous and threatens the organs that are affected. With aggressive treatment and monitoring it can be quieted and total inactivation of the disease (remission) is possible. King, Talmadge E., MD. "Clinical features and diagnosis of eosinophilic granulomatosis with polyangiitis (Churg-Strauss)," UptoDate. Updated Jul 8, 2016. What symptoms have you experienced with your Churg-Strauss Syndrome? What kinds of treatment, including medication, have helped manage the symptoms of your Churg-Strauss syndrome? How has Churg-Strauss syndrome impacted your life? Cyclophosphamide (Cytoxan) is a drug prescribed for the treatment of certain cancers including breast cancer, leukemia, and ovarian cancer. Side effects, drug interactions, patient safety information, and pregnancy and breastfeeding information should be reviewed prior to taking any medication. Relapsing polychondritis is an uncommon, chronic disorder of the cartilage that is characterized by recurrent episodes of inflammation of the cartilage of various tissues of the body. Tissues containing cartilage that can become inflamed include the ears, nose, joints, spine, and windpipe (trachea). Tissues that have a biochemical makeup similar to that of cartilage such as the eyes, heart, and blood vessels, can also be affected. Nonsteroidal anti-inflammatory medications (NSAIDs) is used as treatment for mild cases of the disease. Steroid-related medications also are usually required.